Greetings from The 88 Project! We are bringing you news, analysis, and actions regarding human rights and civil society in Vietnam during the week of December 4-10. We think of all political prisoners and activists at risk today as December 10 is Human Rights Day. 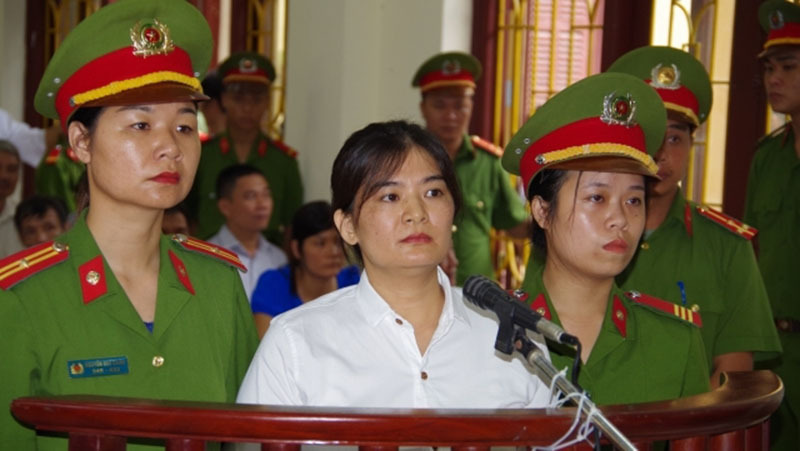 News came out this week that the appeal trial of Tran Thi Nga will be held on December 22. Two priests were prevented from traveling abroad for “national security” reasons. Don’t miss the Vietnamese magazine’s article on the worrisome trend of cyber attacks against activists since last month. There is more news and analysis on Mekong Review – a magazine that covers Southeast Asia’s literature and politics, a rare protest of drivers in Southern Vietnam that forced the government to review charges at a toll gate, and the experience of Vietnamese citizens with corruption. Please take action for the members of the Brotherhood for Democracy who are currently being held incommunicado and need medical attention. And consider making a donation via the NOW! Campaign to support families of Vietnamese political prisoners. The appeal trial for Tran Thi Nga will be held on December 22 by the High People’s Court of Hanoi at the headquarters of the People’s Court of Hanam province. She was sentenced to 9 years in prison and 5 years of probation on July 25, 2017 under Art. 88 (“propaganda against the socialist state”). Since her arrest on January 21, and even after her first instance trial in July, she has not been allowed to see her family. There is report that she has been in solitary confinement. Nga has two children of four and seven years old. Today, December 10, marks the 69th anniversary of the Universal Declaration of Human Rights. On this Human Rights Day, we remember all political prisoners and activists who risk their own safety to defend, for themselves and for others, the fundamental rights that are enshrined in the Universal Declaration and recognized in the Vietnamese Constitution. Please check out the NOW! Campaign – a coalition of 14 human rights organizations that was launched in November 2017 to call on Vietnam to immediately and unconditionally release all prisoners of conscience. The campaign also maintains a database of 165 prisoners of conscience and a donation page where you can contribute to support them and their families. This week, two priests were forbidden to travel abroad. On December 5, Father Joan Luu Ngoc Quynh of Thai Ha Redemptorist Church in Hanoi was stopped at Noi Bai International Airport when he was on the way to go to Paris to participate in a religious event. On December 6, at Tan Son Nhat airport in HCMC, Father JB Nguyen Dinh Thuc of Song Ngoc parish, Nghe An province, was prevented from going to Australia to attend a hearing on Vietnam human rights by the Parliamentary Joint Committee on Human Rights of the Australian Parliament. The authorities invoked “national security” as the reason for both bans. Activists believe that the two priests were targeted for their activism. Thai Ha Church has opposed to Hanoi’s attempt to seize its properties, and often holds vigils to pray for political prisoners. Besides Father Luu Ngoc Quynh, two other priests of Thai Ha Church, Juse Nguyen Van Phuong and Nguyen Ngoc Nam Phong, had previously been barred from going abroad. Father JB Nguyen Dinh Thuc has been targeted this year for his activism in holding Formosa and the government accountable. Don’t miss this article by Tran Vi in The Vietnamese, depicting the worrisome trend of cyber attacks against activists amidst intensified crackdown against dissidents. Since late November, many independent news websites have reported that access to their sites has been blocked. Dan Luan, a popular site, was under DDoS attack for about a week in late November. Also in the same month, several popular Facebookers lost access to their accounts because they were reported by anonymous users to Facebook for “violations of community standards.” The Vietnamese government has been long believed to maintain an active group of hackers and troops of “paid opinion shapers” to carry out daily attacks on activists and bloggers. Please take Amnesty International’s Urgent Action for Pham Van Troi, Truong Minh Duc, and Nguyen Trung Ton. The three were arrested on July 30 under Article 79 for ties to the Brotherhood for Democracy. They are being held in incommunicado detention and need access to healthcare treatment. And please consider making a donation via the NOW! Campaign to support families of political prisoners.